Hortus Camdenensis | Narcissus jonquilla L.
Erect to spreading, narrow, semi-cylindrical leaves and heads of up to 5 strongly-scented, golden yellow flowers, with small, pointed perianths and tiny, flat cups, in spring. To 30cm. There are a number of varieties varying in stature or form of flower. The narcissi often given the common name of ‘Jonquil’ are usually tazettiformes. [RHSE, Hortus, Baker Am.]. First botanically described by Linnaeus in 1753 [Sp. Pl. p.290/1753]. 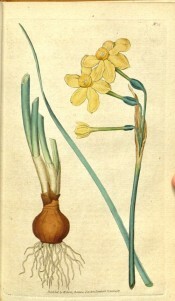 ‘The fragrant jonquil is a native of Spain, flowers in the open ground, about the latter-end of April, or beginning May, and will thrive in almost any soil or situation, but prefers, as most bulbs do, a fresh loamy earth; indeed such soil is favourable to the growth of most plants, as being exempt from a variety of subterraneous insects, which are apt to infest ground which has been long cultivated. It is found in the gardens with double flowers. Our plant accords exactly with the description of Linnaeus above quoted, but must be carefully distinguised from some others very similar to it.’ [BM t.15/1787]. ‘A general favourite in most gardens where it is either grown as a hardy spring bulb or forced for the sake of its brilliant, golden-yellow, sweetly perfumed flowers.’ [Burbidge]. Introduced to Britain in 1596. [JD]. THS vol.1 p.358/1805-1812. Listed in all published catalogues [B.341/1843]. 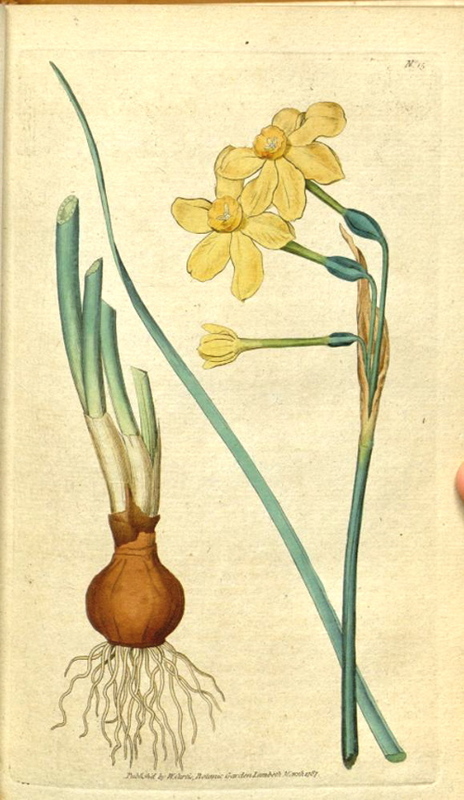 Probably the plant received per ‘Sovereign’ in February 1831 under the name of Jonquil. [MP A2948].